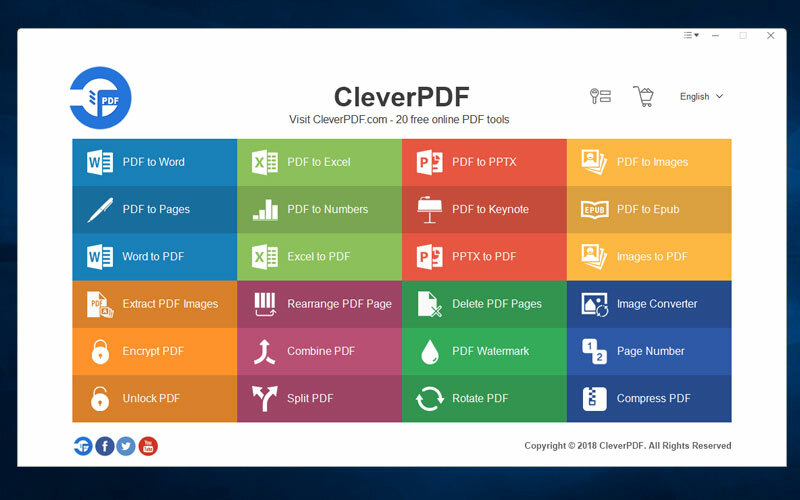 CleverPDF offers 24 PDF tools, all the functions on CleverPDF.com are also available in the desktop versions. Desktop version offers 24 tools in 3 categories: Convert PDF, Create PDF and PDF Utility. All the functions support batch processing, you can process multiple files at once in desktop version. Provide more flexible output options for your PDF conversion task. The powerful table detection feature helps you accurately extract table from PDF to Excel or other formats. Process your PDF files securely on your local computer without uploading, higher safety level for your sensitive files. Just like the online version, desktop version is extremely easy to use, it takes no more than 3 steps to get the job done. It is available in English and 16 other languages. Create PDF functions are completely free; PDF converter functions convert 3 pages for each file; Utility functions support files less than 10 pages. This page was last modified on 10 January 2019, at 17:52.